I am sure you have heard this advice more than gazillion times. After all, this is what all the internet marketing experts preach online. These experts will also tell you that email marketing has the highest ROI. But what most of them don’t tell you is how to actually build an email list. So, In this guide, I will share with you 7 actionable strategies you can use today to skyrocket the growth of your email list and keep the revenue ship sailing. 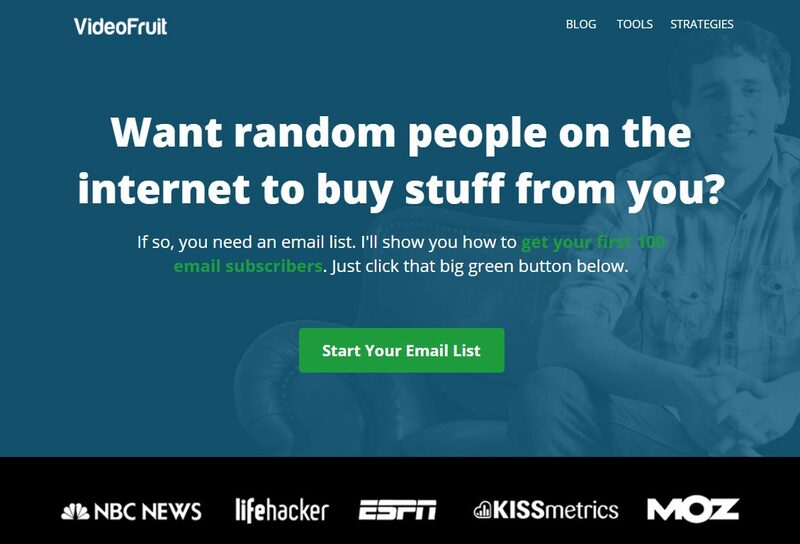 You don’t need a lot of visitors to start building your email list. Most people believe that they need at least a thousand visitors a day before they can start building their email list. As a result, these people never actually start building their email lists. Even if you are getting just a 100 visitors a day and your overall conversion rate is 2%, you will be able to collect 60 new subscribers every month. While this number might sound negligible, it keeps on adding up. And believe it or not, you are actually losing thousands of potential subscribers every day if you aren’t building an email list from the start of your blogging journey. Most of the successful bloggers and marketers online regret not starting to build their email list from day one. Don’t be one of them and start building your email list today. So, if you are ready to start building your email list, let’s dive in. Most people don’t take advantage of their blog’s homepage. Your blog’s homepage can help you generate literally hundreds of new subscribers every day. If you are not using your homepage to build your list, you are definitely losing a lot of potential subscribers. To make the most out of your homepage and collect emails, all you have to do is turn it into a landing page. 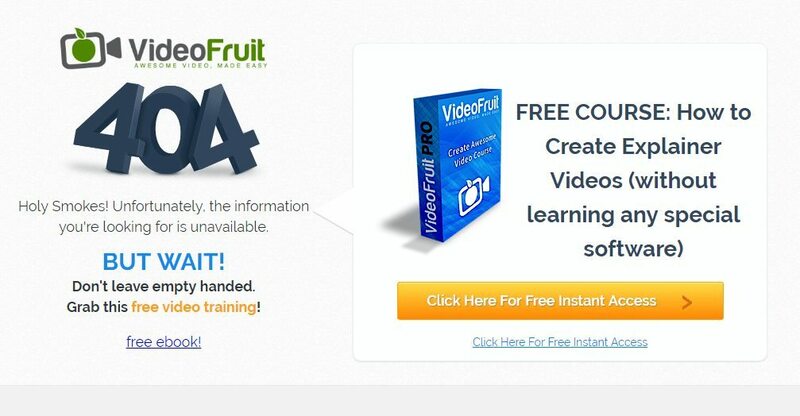 The above image is a screenshot of Bryan Harriss’ Videofruit website. If you visit this site’s homepage, you will find that it is essentially a landing page designed to collect more email subscribers. On the homepage, Bryan offers a free eBook on building an email list and another free eBook on getting more traffic at the bottom of the page. Turning your homepage into a landing page just like this one will turn your homepage into a killer subscriber generating machine. Now, I know this is not possible for most businesses. If you are selling a product or service, you will want to display your products on the homepage. If that is the case, you should try using a feature box. Instead of turning your website’s main homepage into a landing page, you use your blog’s main page (blog roll) to collect emails. 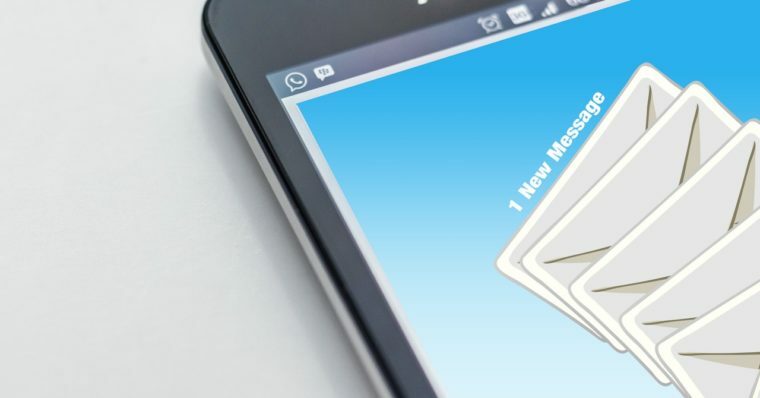 While you can use a generic offer like “Subscribe to my email list” on the feature box and still collect a good amount of email subscribers, it is better to offer an incentive to sign up. This is what their audience is looking for and hence their conversion rate will be higher than a generic offer. Most websites only display a single opt-in form. … you need to place opt-in forms at locations where people can actually find them. Placing an opt-in form in the footer and hoping to get some subscribers isn’t going to work. You need to place your opt-in forms in as many places possible. The more chances you give people to subscribe, the better. An opt-in form in the sidebar. An opt-in form after content. In-Content opt-in form (if possible). While you can collect a good amount of subscribers displaying pop-ups when people enter your site, displaying popups when the visitor is about to leave (exit-intent) will result in a better conversion rate. If you are interested in setting up an Exit-Intent popup for your blog, check out our Exit-Intent Popups extension. Your 404 Error Page rarely gets any visitors but when it does, those visitors just bounce back to where they came from. While in the short-term, it doesn’t even matter but in the long-term, the number adds up and builds up into a large number of lost potential subscribers. To make the most of your 404 error pages, you should start offering a sign-up incentive. This will not only help you get more subscribers but will also improve your site’s bounce rate. He offers a free course on creating explainer videos. Offering an incentive on your 404 page that genuinely helps your audience will definitely help you collect more subscribers on your website. A content upgrade is basically a bonus related to your post. You offer this bonus to the user in exchange for their email. This strategy worked incredibly well for Brian Dean. He increased his conversions by 785% using this simple technique. All you have to do is create a bonus that is related to your content. This bonus can be a bonus video, a report or just a PDF version of your post. The best way to do this is with a 2-step opt-in process. Instead of displaying a form, you simply display a link to download the content upgrade (bonus). 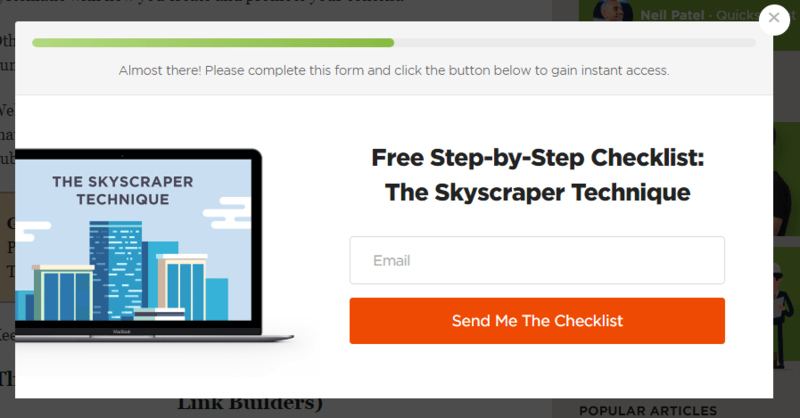 While using a single-step opt-in form works, you will see a much better conversion rate with a 2-step opt-in process just like in the example above. Turn your post into a downloadable PDF. People love to download and store PDF versions of posts they like just so they can read them later. Instead of offering everything in your post, save some of your content, put it in a PDF and offer it to your audience. For example, if you are writing about 25 Tips on Getting a New House, instead of offering all the 25 tips directly in the post, save 2 or 3 from the post and offer them as a bonus in a PDF file. Offer a Spreadsheet or a template as a bonus. If you don’t know how to convert your post into a PDF, you can use the free tool, PrintFriendly, that helps you convert any page into a PDF file. When someone reads your author bio, it means they are interested in finding out more about you. This is a great opportunity to ask them to join your email list. As you can see in the above screenshot, the author of the guest post simply asks the readers to join her email list. This is a great example of this tactic in action. Just like your author bio in a guest post, you can use your Twitter bio to grow your email list. 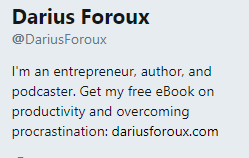 As you can see in the above example, Darius Foroux, a famous productivity blogger, asks people to sign up for his email list in his twitter bio. Instead of simply asking people to join his email list, he offers a free eBook on productivity as a signup bonus. Once again, just like Guest Posts, you can get away by just asking people to sign up for your email list and it will work. But if you want a better conversion rate, offer people an incentive like a free eBook to sign up. Webinars are a great way of building your email list. Most people believe webinars are only helpful when it comes to selling a product to your audience. But that’s not all webinars are useful for. You can use them to not only grow your email list but also get thousands of eyeballs on your blog. You do this with partner webinars. Instead of doing a free webinar for your blog’s current audience or your email list, you find someone who already reaches your target audience and then you offer them to do a free webinar for their audience. To sign up for the webinar, people will have to join YOUR email list. This type of webinars can really skyrocket the growth of your email list. To use this strategy, all you have to do is find someone in your industry who already reaches a large enough audience. Now, once you get someone to do a webinar with you, instead of making it just a one-time deal, you can record the webinar and offer it as a sign-up incentive or a content upgrade on your blog. You can watch all of the webinars on their site just by signing up for their newsletters. Implementing these list building strategies will definitely help you build your email list and boost the growth of your blog. While some of these strategies like Webinars and Guest Posts require some time to implement, others often don’t take more than an hour. The strategies you use is not as important as just getting started. Just pick one of these strategies that you feel comfortable implementing, and start building your email list. Because at the end of the day, the number of leads you collect for your business matters more than the strategies and tools you use. If you have any questions or tips of your own you want to share, let us know in the comments section below. Thank you very much, this was super helpful. Awesome, glad you found it useful. The Content Upgrade tip is brilliant and I can put it to use immediately. Thanks for an excellent article! Hey Eliza, glad @mohit’s insights on email marketing were of use to you. Let us know how it goes, especially if your using Popup Maker ;). I find the using 404 page to capture leads as brilliant. Why didn’t I think of it. Thanks Mohit for another brilliant piece. Thank you. Iam just beginning and I need all the help I can get.